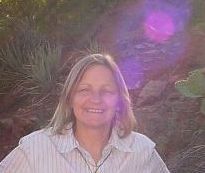 Anna Rita is an energetic healer, empath, mystical tour guide and vibrational elixir-maker based in Sedona, Arizona. She is living her dream and walking her talk by being of service to others and dwelling in one of the most beautiful and sacred places on the planet. Anna Rita moved to Arizona in 1993 from Los Angeles, California and began studying and practicing alternative methods of healing with total focus and commitment. In 1999 she was ordained into the Order of Melchizedek by Rev. Dan Chesbro of Sanctuary of the Beloved and vowed to serve the planet and all therein through Free Will and individual expression. She was attuned to the Reiki system of natural healing in 2001 and has studied Holographic Repatterning with Chloe Faith Wordsworth. After having been introduced to flower and mineral essences, Anna Rita saw profound and beneficial changes in her life and felt the desire to share those tools with others. In 2002 she became a Registered Essence Practitioner of Nature’s Alliance in Healing for Soul Integration and Self-Empowerment. She was attuned to the angelic healing modality of Integrated Energy Therapy in 2006 and is also a Violet Flame Reiki Master. As a spiritual consultant and energetic healing facilitator based in Sedona, Arizona, Anna Rita is dedicated to promoting self-empowerment, evolution of consciousness and responsibility for co-creating Heaven on Earth. Sedona Sacred Arts was founded in 2005 as a company committed to providing tools and educational materials to assist in empowering individuals to achieve their highest potential. Sonoran Light Essences provides world class flower and crystal essences to clients around the globe.